When involved in an accident, there are steps you should take to maintain your personal safety, the safety of others involved in the accident, and the safety of other motorists and pedestrians in the area. In the winter, there are a few extra factors to keep in mind. Read on to stay safe. Due to shorter days, cloudier weather, and the increased likelihood of precipitation, reduced visibility is an increased problem during the winter. It is imperative that you make sure you are visible to everyone around. Snowy, icy, or wet roads mean that other vehicles may have trouble stopping. Make sure that you leave adequate distance for other vehicles. 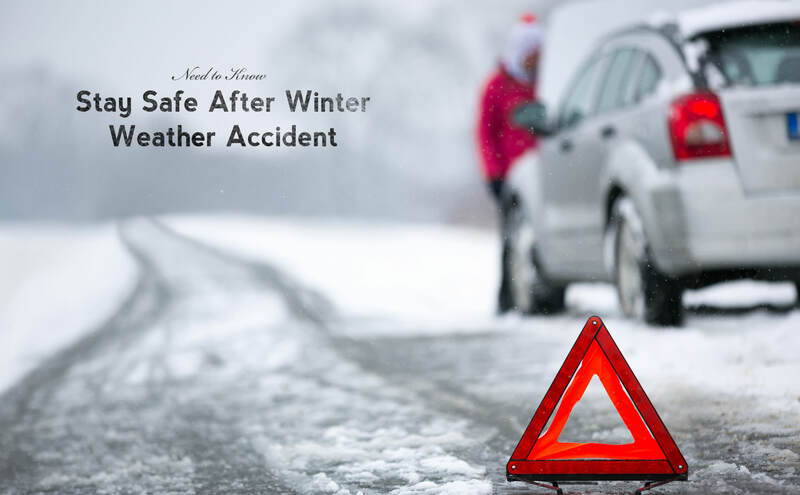 Whether you were involved in the accident and are waiting for help to arrive or are making sure everyone is okay and clear the road, you should keep the following things in mind after a winter car accident. This can be a difficult thing to do after an accident. You will probably be feeling a surge of adrenaline and perhaps panic, but it is important to remain calm as much as you can. The accident has already happened, so your next focus should be on safety. Check yourself for injuries, and then check your passengers. Getting out of the vehicle might not be safe. Do a thorough check of your surroundings before exiting your car. If it is safe to do so, check the occupants of the other vehicle for injuries. Even if you aren’t certain it is necessary, it is best to call the authorities. Pay close attention to your surroundings so that the situation doesn’t get worse. If and when it is safe to get out of your vehicle, do so and move away from the road. Take photos of the accident if it is possible. If safe, move your car off the road to allow others to safely pass as any obstacle in the road has the potential to cause even more accidents especially when the road is wet and visibility reduced. Do whatever you can to make yourself and your vehicle more visible, including flares, lights, and reflective or bright clothing. If the accident happened on a curve, place warning lights far back so that unsuspecting motorists don’t get surprised. Use emergency blankets or extra clothing to keep yourself warm. If it is very cold and you need to run your engine to stay warm, make sure the tailpipe isn’t clogged with dirt or snow. Following these tips should keep you safe, and get you back on the road in the smoothest possible manner. After the accident has been taken care of, it’s important to make sure your vehicle is in operable condition. If you think your vehicle is driving differently after an accident – even a small one – it is important that you take it in to be checked by a professional. Safety is our #1 priority, so if you have any questions about getting back on the road safely, just give us a call.